Director – Robert Wise, Screenplay – Carlos Keith [Val Lewton] & Philip MacDonald, Based on the Short Story by Robert Louis Stevenson, Producer – Val Lewton, Photography (b&w) – Robert De Grasse, Music – Roy Webb, Music Supervisor – C. Bakaleinikoff, Art Direction – Albert S. D’Agostino & Walter E. Keller. Production Company – RKO Radio Pictures. Edinburgh, 1831. Medical student Donald Fettes goes to his lecturer Dr MacFarlane saying he is too poor to continue with his medical studies and so MacFarlane agrees to take him on as his assistant. Fettes is disgusted when he finds that one of his jobs is to receive the corpses that MacFarlane uses for study and that these have been stolen from the graveyard by cabman John Gray. MacFarlane convinces Fettes that some unpleasant truths are necessary in the name of science. Gray then pushes MacFarlane to conduct a complex spinal operation on a crippled child. When MacFarlane protests that he has no bodies on which to study the operation, Fettes is shocked when Gray goes out and murders them. Slowly Fettes becomes drawn into the wretched games Gray plays with MacFarlane, blackmailing MacFarlane with the information he could reveal about his involvement in the Burke and Hare case. Producer Val Lewton worked at RKO Radio Pictures during the 1940s where he became one of the most important names in the horror genre. Lewton initiated an entirely new approach to horror with Cat People (1942), one where audiences were left deliberately uncertain as to whether what was transpiring was real or in the minds of the superstitious. Lewton had considerable success with this approach in ensuing films such as I Walked with a Zombie (1943), The Ghost Ship (1943), The Leopard Man (1943), The Seventh Victim (1943), The Curse of the Cat People (1944), Isle of the Dead (1945) and Bedlam (1946). 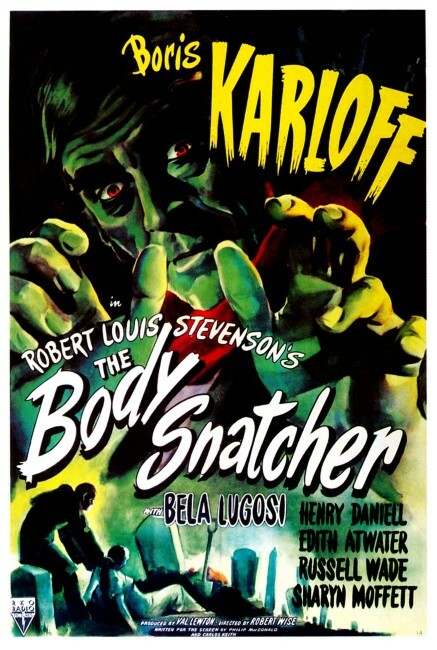 The Body Snatcher was the second to last horror effort Val Lewton would make in his brief tenure at RKO. The Body Snatcher is also notable as being the first solo directorial effort of Robert Wise who would go onto such celebrated successes as West Wide Story (1961) and The Sound of Music (1965) and noted genre efforts such as The Day the Earth Stood Still (1951), The Haunting (1963), The Andromeda Strain (1971), Audrey Rose (1977) and Star Trek – The Motion Picture (1979). Robert Wise had previously worked as editor for Orson Welles on Citizen Kane (1941) and The Magnificent Ambersons (1942), before debuting for Val Lewton as co-director of The Curse of the Cat People. With his last two horror films – The Body Snatcher and Bedlam – Val Lewton began to turn away from the ambiguously supernatural to dark, ghoulish period pieces. 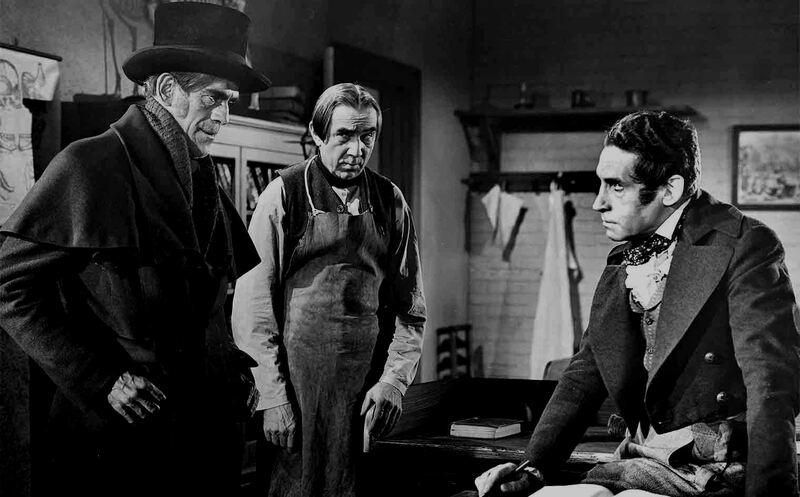 The Body Snatcher was the first of several films based on the story of the infamous 19th Century body snatchers Burke and Hare, two Irish immigrants to Edinburgh who murdered sixteen people and sold their bodies to an anatomical lecturer. Other film versions include The Greed of William Hart (1948), The Flesh and the Fiends/Mania (1960), The Anatomist (1961), Burke & Hare (1972), The Doctor and the Devils (1985) and John Landis’s comedy remake Burke & Hare (2010). The Body Snatcher is based on an 1884 short story by Robert Louis Stevenson, the author also of Treasure Island (1883) and The Strange Case of Dr Jekyll and Mr Hyde (1886). Stevenson was born in Edinburgh some twenty years after the Burke and Hare murders. Although the story was written in the last decade of his life, he would have been drawing on an incident that had an infamy in the town of his childhood. Robert Wise demonstrates a considerable mastery of the trademark Lewtonian effect of suggested horror. One scene that stands out in the memory is the one where the camera sits watching an old woman singer as she disappears down a gloomy alley followed by Boris Karloff’s cab – she vanishes off into the darkness singing and the cab follows after, there is a long moment and then the singing stops with a quiet yelp. The scene where Boris Karloff steals the first body is conducted with a nicely shocking economy – we seeing an exaggerated shadow creeping along the graveyard wall as we hear the dog waiting beside its dead master’s grave whining, the shadow swings the spade with a clang and the dog’s howl suddenly dies. The only lapse is the climax and the scene with the body under the sack returning to life, which, while shocking, adds a quasi-supernatural element that jars with the rest of the film’s carefully established mood. 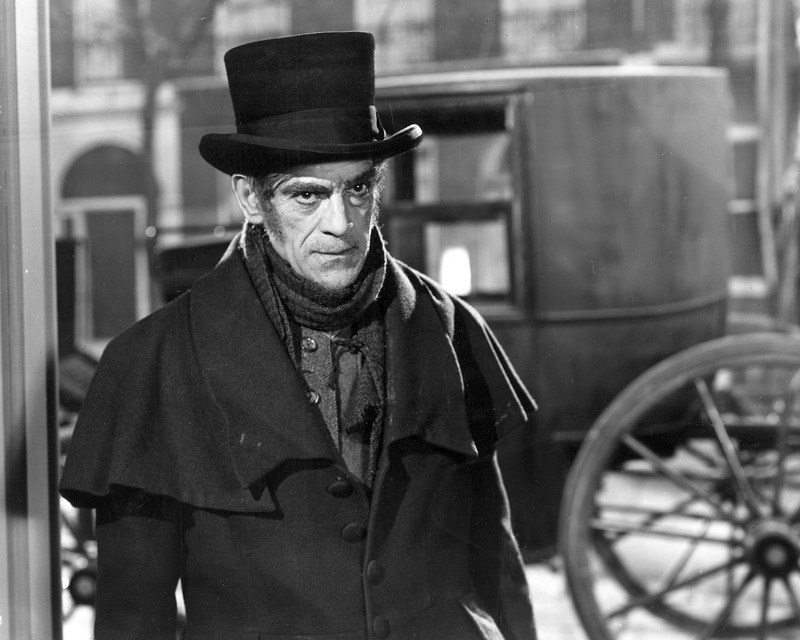 The Body Snatcher contains one of Boris Karloff’s finest performances. The character is one of sharp ambiguity – on one hand kind to children and full of overly exaggerated genteel but capable of turning cold at a moment’s notice and delivering wonderfully implied threats. Even Bela Lugosi manages to give a good performance, disguising his hammy propensities in a brief role as a genuinely thick character. Not too much attention is paid to obtaining authentic Scottish accents, but this does not matter too much in this otherwise fine film.